Home Merkel V4 Report: Germany fears EU migration reforms will trigger an influx of migrants. V4 Report: Germany fears EU migration reforms will trigger an influx of migrants. The European Parliament’s amendment to the Dublin Regulation could see many more migrants settling in Germany under a new “family reunification” scheme. ** The “mere assertion of a family connection”, which is complete madness, could blow-up Germany. What will the far-left extremists of the EU Parliament think of next? Their fears are correct, but what an interesting statement from Germany. Was Merkel aware that her policies and rhetoric “triggered” the initial influx? Did she fail to consider the blowback or did she think about the consequences of “family reunification”. Why is she still in power? One way or the other, Germany needs to get serious about the deportation of all these aggressive male migrants or they will eventually be flooded with very large extended families. They probably will not even need proper identification. Let’s not forget that Poland and Czech Republic are right next door to this mayhem. “As a result, a member state hosting many so-called ‘anchor persons’ will take over responsibility for far-reaching family associations,” it said. 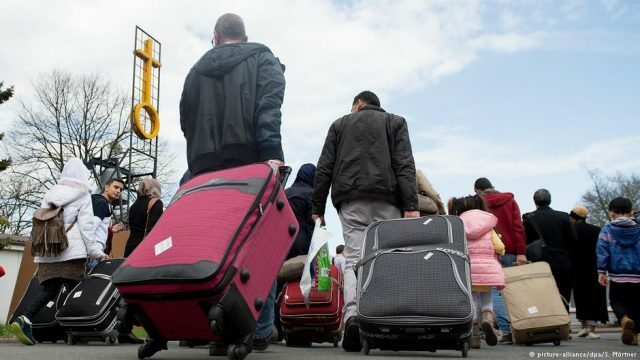 “If every one of the more than 1.4 million people who have applied for asylum in Germany since 2015 becomes an anchor for newcomers arriving in the EU, then we’re dealing with (numbers) on an entirely different scale compared to family reunifications,” said Ole Schröder, a parliamentary state secretary in Germany’s Interior Ministry. The Dublin Regulation requires people seeking asylum to register in the first EU state they enter, and for that state to assume responsibility for processing their claim. But if the proposed reform is passed, responsibility could shift from the arrival state to the EU country where any of the applicant’s relatives live. Under such a change, “Germany would have to accommodate significantly more asylum seekers,” said an Interior Ministry memo, quoted by Der Spiegel. Any caps on refugees would be “nullified,” the memo added. *** One of these days, Horst Seehofer and the CSU will realize that joining forces with Angela Merkel and Martin Schulz is the “kiss of death”. Likewise, the CEE nation states may want to start pondering their association with the EU Parliament and all these far-left socialists in Brussels. Do they really want Guy Verhofstadt, Gianni Pittella and these fanatical ALDE/Socialist/Green organizations determining their values and way of life? The EU is absolutely “out of control” but it will only get worse if they succeed in establishing mandatory migrant quotas or Article 7 procedures against Poland. These two battles will determine who controls Europe: Brussels and the EU Parliament or the European nation states? We can only hope that all the leaders of Visegrad and the CEE region realize the stakes involved with these EU initiatives. Now is not the time for weakness or the myth of “EU solidarity”. Hungary and Poland could use some reinforcements. Someone once said “today’s silent observers will be tomorrow’s targets”.